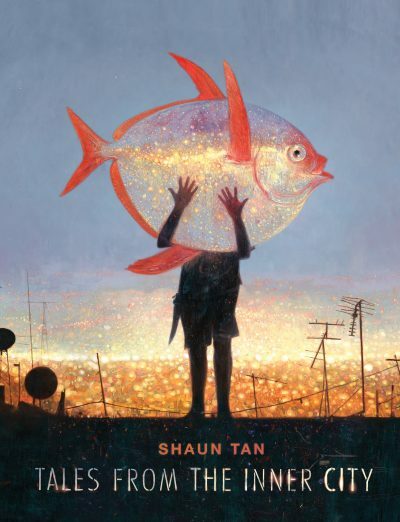 This extraordinary companion to Shaun Tan’s 2008 book Tales from Outer Suburbia taps into our subconscious, our ancient primitive longings, and our need for love, acceptance and understanding. In this volume, the focus is on the real and imagined animals living among us. Whether they’re living just next door, on the office floor above, or up in the sky, these animals reflect back our human natures and pretensions. The book is composed of micro-fictions, poems and short stories, and each is accompanied by at least one magnificent painting depicting the animal. These are metaphorical stories that will seep into your dreams and make you wake up longing to escape from the inner city, to be among the animals, only to remember that we are also animals—foolish and wicked, loving and intelligent, proud, and weak. These creatures are our brothers and sisters. This is a profound, stunning work of art that has many layers. Tan has created a deeply moving, elegant and sophisticated collection of stories and paintings that will ask people to reflect on their relationship with nature as well as their own place in the world. There is much to ponder here for readers aged 10 and up.